The establishment of a Commissioner for Democracy, the Rule of Law, and Human Rights will be an important consideration for the 53 Heads of Government of Commonwealth countries when they meet in Australia next month. The post is one of the recommendations of the 10-member Eminent Persons Group (EPG) that was set-up by Commonwealth leaders at their last meeting in Port-of-Spain in November 2009. The EPG was given the task of recommending ways in which the 62-year old Modern Commonwealth could be reformed to make it relevant to its people and its times. 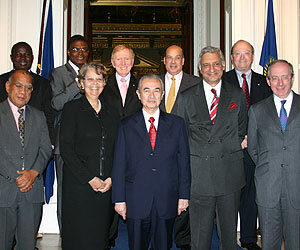 Reaching a conclusion to recommend the post of a Commissioner for Democracy, the Rule of Law, and Human Rights was the result of 13 months of work that included careful contemplation of over 330 written submissions to the Group and many other face-to-face meetings in many regions of the Commonwealth. The submissions were made by governments, trade unions, and several civil society organizations. An overwhelming number of the submissions pointed to the danger the Commonwealth faces of becoming ineffective for its member states and the wider international community. In particular, the submissions emphasized that, for the Commonwealth to speak with an authoritative voice on issues such as development, environment, and the urgency of making the international financial system more just and responsive to developing states, it has to be seen to be upholding the values for which it says it stands. Over the years of the Commonwealth’s existence, its member countries have placed democracy, the rule of law and respect for human rights at the heart of their shared beliefs. Indeed, every country that has joined the Commonwealth did so on the basis of a commitment to the common values of the association. Commitment to these values, and firm action in support of them, were evident in the Commonwealth’s leadership role in ending racism in Southern Africa. Even though there was reluctance on the part of successive British governments to deal sternly with a white-minority regime in what was then Southern Rhodesia (now Zimbabwe) and later in Apartheid South Africa, the Commonwealth (including Britain in the end), succeeded in moving forward collectively to bring democracy, the rule of law and respect for human rights in Zimbabwe and South Africa. This collective position in Southern Africa gave the Commonwealth the moral stature to be equally forceful in matters such as economic justice in international affairs. For instance, it was on the back of its moral authority that the Commonwealth launched an initiative in the UN organization, the World Bank and the International Monetary Fund to lift the burden of debt from the shoulders of poor countries. The Commonwealth spoke. And, it was heard. Action followed. Many countries, such as The Gambia, Guyana, Uganda, Tanzania and Zambia, that are doing much better economically today benefitted from the debt relief that followed. Development and democracy are intertwined. It is not possible to achieve one without the other in sustainable terms. More than parallel paths, they are conjoined. When there is slippage in one of them, there is slide in the other. In recent years, a number of Commonwealth countries have strayed away from the collective values of the association, and, except for the unconstitutional overthrows of governments, the Commonwealth has not spoken out, as a body, or acted jointly to bring errant countries into compliance. Yet, Heads of Government have mandated the Commonwealth Ministerial Action Group (CMAG) to take action against countries over a range of delinquencies. This absence of action has severely hurt the Commonwealth’s credibility. At the heart of this problem has been an absence of credible and verifiable information in a timely manner that could allow both the Commonwealth Secretary-General and CMAG to engage a government before its violations of the Commonwealth’s values become serious or persistent. It is to fill this gap that the EPG recommended the post of Commissioner for Democracy, the Rule of Law, and Human Rights. The principal task of the Commissioner would be to provide the Secretary-General and CMAG with carefully researched and credible information upon which to make decisions. The post has been set at the level of “Commissioner” precisely because it is envisaged that the occupant would be a person of sufficient standing and possessing significant diplomatic skill and sensitivity as to be able to engage any government in a mutually respectful and beneficial manner. Far from being punitive, the Commissioner’s role would be co-operative, designed to avert conflict and ensure sensible measures by all to maintain Commonwealth values. The majority of Commonwealth countries will never hear from, or see, the Commissioner. The post will not require member-states to fill out questionnaires as they are required to do by the UN Human Rights Commission, nor will governments be burdened by inspection teams and peer reviews. These are tasks already being undertaken by UN institutions that are much better resourced than the Commonwealth, and whose findings are publicly known. It will not be within the Commissioner’s remit to recommend the suspension or expulsion of a country; this responsibility remains with CMAG or Heads of Government themselves. The post of Commissioner should be embraced by all Commonwealth governments precisely because the Commissioner will be a very senior officer with the capacity to gather reliable and information in a way that involves governments. Further, for the Commonwealth to continue to advocate for development, for money to militate against Global Warming, for reform of the criteria under which small states are graduated from concessionary financing, it has to be credible in relation to democracy. Adherence to democracy, the rule of law and human rights is now a strong test for any country’s qualification for investment both local and foreign. Increasingly, it is also becoming so for the granting of official development assistance. On the other side of the coin, Governments that have been aid donors, but have not respected the rule of law or upheld democracy and human rights have faced intense upheaval within their own borders. No government in the Commonwealth intent upon upholding democracy, the rule of law and human rights would fear the creation of the post of Commissioner recommended by the EPG. It will strengthen the Commonwealth and enhance its credibility as a strong advocate for development and the improvement of people’s lives.